The right home remodeling can do much more than increase your enjoyment of your home. It can also increase the value of your home, netting you more when you sell or helping you earn more in rent. The outside of your home isn’t technically a room, but it is one of the most popular areas to remodel for Arizona homes. In particular, swimming pool additions and remodeling are at the top of the list. Porch reports that 42.8 percent of homes in the Phoenix-Mesa-Scottsdale area have swimming pools, and Arizona has the highest number of swimming pool companies per person. It makes perfect sense. With the blazing temperatures every summer, Arizona residents need a swimming pool to stay cool. Adding one to your home or renovating the one you have can make a big impact on your home’s value. In addition, updating your landscaping can have a big impact on your home’s value. Landscaping improves curb appeal, making your home look more sophisticated and luxurious. You don’t have to invest in the most exotic or expensive plants. You can create a beautiful look with some flowering shrubs, an ornamental tree or two, and a retaining wall or patio. Add a porch or deck to your home will add the “wow” factor. You should expect to get the full cost of these upgrades back when you sell the house. Window treatments can create a new look or vibe for a room, and nowhere is that more important than in your living room. You will entertain guests most frequently in the living room. Even people who just stop by for a second are likely to stand in the living room. So it’s important that you make your living room look great. A home improvement contractor in Phoenix can build beautiful window treatments for you, such as cornices, rolling barn doors, or indoor shutters. Your contractor can also change out the windows, not just replacing the windows but making the changes needed for a new kind of window. For example, your contractor can enlarge the space to put in bigger windows and let in more light. Or your contractor can take out square windows and put in round windows. Other living room upgrades can include new fireplace stone or new flooring. Imagine the dramatic change that taking out carpets and putting in hardwoods or tile would create. As the homeowner, you likely spend a large part of your time in the kitchen. You go there to cook, to eat, and to clean. You even go there just to spend time with your family. Upgrading your kitchen can make it much more enjoyable to be in the space. Plus, kitchen remodels have a big return when you sell your home. Popular home remodeling projects for the kitchen include getting new cabinets, new floors, and new appliances. If you don’t have the budget for those major upgrades, you can get a lot of bang for your buck with minor upgrades. You can replace the cabinet doors and drawer fronts instead of the whole cabinets, or you can hire a home remodeling contractor in north Phoenix to paint the cabinets. You can have your tile floors professionally cleaned and the grout restored, or you can have an epoxy coating applied to your concrete floor. Talk with your contractor about where to make the most impact with your budget. The same upgrades that you can perform in the kitchen are available in the bathroom. Instead of appliances, you would be looking at things like the tub, toilet, or sink in the bathroom. For example, you can take out your old fiberglass tub and put in a huge, whirlpool tub or even an antique claw-foot tub for soaking. With the right tile and lighting fixtures, you can transform your bathroom into a spa. Working with an experienced home improvement contractor will be key. Your contractor will let you know what changes will work best with the space. One of the most popular upgrades you can make to any other room in your home is to get a better HVAC system. Whether you are in the bedroom or the basement, you are always going to want to be cool in the summer time and warm in the winter. Arizona winters may be mild, but the summers are brutal. You need an efficient and reliable HVAC system so you have a welcome respite wherever you are in your home. If you invest in major renovations to your home, you may need to consider upgrading your HVAC system, as well. Creating additions or enlarging rooms by taking out walls can change the heating and cooling needs in your home, and your current HVAC system may not be up to the task. Investing in home remodeling in Phoenix, AZ can have a big payoff, not just in the potential increased sale price of your home but also in how much you enjoy coming home every day. Consider talking to a home remodeling contractor about some of these popular upgrades to your Arizona home. 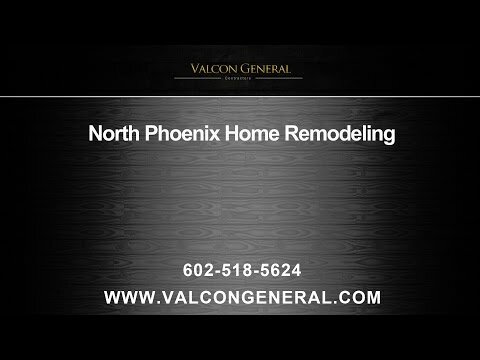 Valcon General can help with your home remodeling projects in Arizona. Our experience home improvement contractors can handle just about any remodeling job you want to take on, and they will perform the work with expert skill and quality craftsmanship. Our contractors will help you determine the very best upgrades to make to your home for the biggest return on your investment. Call us today to discuss your vision for your home remodeling projects.